Search Engine Optimization, or SEO, is a marketing tactic that focuses on gaining organic, or non-paid, traffic visibility and search engine results. Many people think that SEO is a very technical necessary evil. While it is true that SEO is technical, it also has creative elements that can help improve rankings and increase awareness on search engines. Here are some of the basic components of SEO that you should know to get you started on learning about SEO! 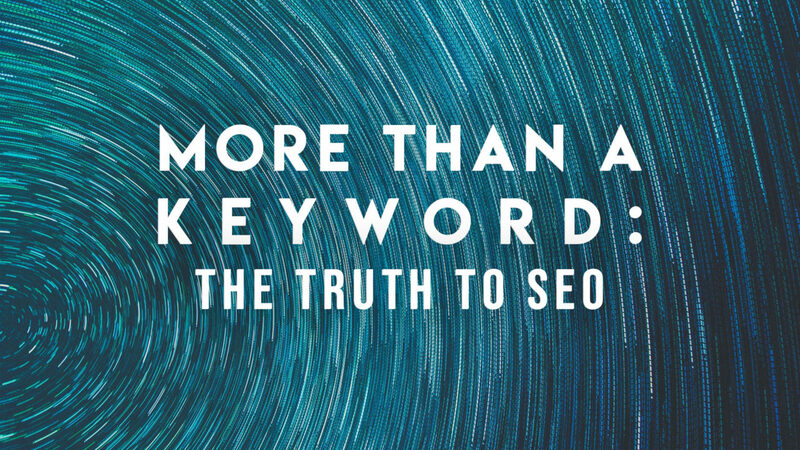 Yes, SEO is more than a keyword however, keywords are still important! Keywords are all about researching terms and phrases that will in turn, generate traffic to your website. In order to do this, you will need to put yourself in the minds of people in your niche. If you were to conduct an online search, which terms or phrases would you use? There are also some other awesome online tools to help you further dive deep into the search. Google Keyword Planner is great to see what people are searching for locally. Other tools such as Ahrefs, is great for searching globally. Every online tool is different and some will work better than others depending on the needs of your website. Images on your website are a must! “A picture is worth a thousand words” is frequently quoted for a reason. Potential customers are more likely to interact with your content if there are images and therefore, images will dramatically increase the overall user experience. Also, web pages are more likely to rank if they contain at least one image. Listed below are three beneficial ways to optimize your images. Provide an ALT text for all images. Many search engines cannot read images so instead, engine crawlers use ALT texts to identify and recognize your image. The ALT text should describe the image and contain one of the keywords that you previously had identified. Keep it relevant, short, to the point, and do not add any dashes. It is also important to pay attention to the size of the images that you are putting onto your website. Images that are too big can make your page look heavy and can negatively effect your page’s loading time. Lastly, don’t forget to rename the file name for your images! Images with the file name “DSC00033.jpg” will not rank. However, an image with a relevant file name that contains a keyword are more likely to rank. Not to confuse the file name with the ALT text, you should include dashes. For example, the file name for the image used in this blog is “truth-seo.png”. It is relevant to the topic and does not include any “stop words”, or fill-in words such as in, the, or, to, etc. Link building is arguably one of the most time-consuming SEO tricks, but it is also one of the most rewarding. They are so important because they have the potential to send referral traffic to your site. Good link building is a sign of trust. This is important because building trust is essential for long-term success for any company. Why is link building so time-consuming? It takes time to build the credibility of your website and therefore, takes time for other websites to start linking to yours. Patience is key. Do not focus on link building strategies for a few weeks and expect to have numerous major websites start linking to yours. Link building is an ongoing strategy that should continuously be worked on. So what can you do to gain more links from credible sites? #1 always- create great quality content. Next, you can reach out to bloggers or other journalists in your niche, and ask to guest blog after you have created some credibility for yourself on your own website. Everything that has been mentioned thus far are all strategies that will help optimize your website! To add further, post amazing quality content! Search engines want to provide users with the best and most useful content. Today, quality overrides quantity. Additionally, it is important to understand that it is hard for SEO to help out if you are not publishing good content. This is vital for long-term success for your company and website. However, it is critical to remember that good quality work will not rank for you. Additionally, SEO isn’t all about doing one specific thing. In order to ensure that you are fully optimizing your site, you will need to work on all of these tactics. At ADventure Marketing, we are SEO experts. We carry out strong SEO strategies for all of our clients. Contact us today for a free evaluation to see if your website is SEO optimized!